Nothing can beat the classic beauty of hardwood flooring. Nothing can beat the classic beauty of hardwood flooring. That said, there are some places in your home that aren’t very well-suited to hardwood flooring. As you upgrade the flooring in your home, whether it’s with engineered or solid hardwood, keep these tips in mind so you don’t put your hardwood in a bad spot. As long as it is properly cared for, hardwood flooring in these parts of your home will last for years to come! 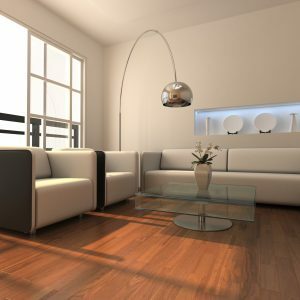 Living Room– Hardwood flooring in your living room will project a cozy look and feel. Whether you’re entertaining or having a quiet night in with the family, your living room hardwood flooring will serve you well. To help keep it looking its best, place a doormat outside so that everyone can wipe excess dirt and whatnot off the bottoms of their shoes. You can even take it a step further and institute a “no shoes inside the house” policy, which is a whole lot more common than you might think. Dining Room– Whether your dining room is super formal or has a more casual family vibe, you can find hardwood flooring to match. Just be sure to wipe up any spills right away to avoid damage. Den– Hardwood flooring and a nice big comfy couch or some overstuffed chairs to just relax and unwind with a book or some conversation. What could be better? Since hardwood flooring is so gorgeous, homeowners have been tempted to install it in every part of their home. While we agree that hardwood is the superior flooring choice, it doesn’t work well in all places. Bathroom– Water is hardwood flooring’s arch nemesis. In the bathroom, there is almost always water coming from somewhere. Even if it’s just by accident, water can easily get on the bathroom floor. If that floor happens to be hardwood, it can quickly be ruined. Laundry Room– Washing machines can leak. Wet clothes can drip. Detergent or liquid fabric softener can spill. You may love the look of your hardwood flooring, but it’s really not a good idea to put it in your laundry room. Foyer– All manner of things can be tracked in from outside, and the foyer of your home will bear the brunt of all of them. Sand, dirt, mud, water, snow, and more can all damage hardwood. Consider something a tad more durable for your foyer and put hardwood flooring in the hall instead. This entry was posted on Friday, September 8th, 2017 at 3:12 pm. Both comments and pings are currently closed.